The Federal Government on Sunday vowed to deal with any persons or groups attempting to trivialise or politicise security issues for politically motivated ends, saying that security agencies would not hesitate to deal with such characters. 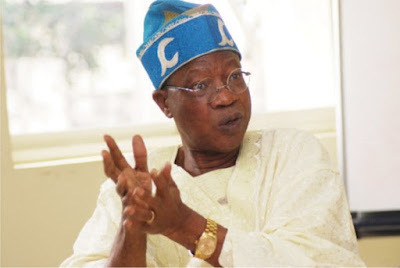 The Minister of Information and Culture, Mr. Lai Mohammed, who said this during a press conference in Lagos, also revised upwards the number of kidnapped and freed Dapchi schoolgirls. Insisting that the government neither paid ransom nor engaged in a prisoner swap, the minister disclosed that 107 persons, comprising 105 Dapchi schoolgirls and two non-students were released by the insurgents. Mohammed stated, “A total of 111 girls were abducted from the GGSTC, Dapchi, on February 19, 2018. That means one student was not captured on the list of the 110 abducted students that was compiled by the school, on the basis of which the Federal Government gave the number of abducted schoolgirls as 110. He added that the insurgents brought the girls back to the location of the kidnapping themselves, following efforts by the government to find long-lasting solutions to the conflict. The minister further said the insurgents were not attacked when they returned the girls to Dapchi because the government had been in cessation-of-hostility talks with them for some time. “Therefore, we were able to leverage the wider talks when the Dapchi girls were abducted. As I said earlier, the insurgents decided to return the girls to where they picked them from as a goodwill gesture. All they demanded was a ceasefire that will grant them a safe corridor to drop off the girls. This is not new. Even in larger war situations, safe corridors are usually created for humanitarian and other purposes. Consequently, a week-long ceasefire was declared, starting from Monday, 19 March. That is why the insurgents were able to drop the girls. This counters the conspiracy theories being propounded in some quarters concerning why it was so easy for the insurgents to drop off the girls without being attacked by the military,” he added. He bemoaned the “reactions of naysayers” that the abduction and release of the schoolgirls at the Government Girls’ Secondary and Technical College, Dapchi, Yobe State, were stage-managed. He said, “This administration’s success in seeking an early release of the Dapchi girls has ruffled many feathers. It has upturned a lot of plans by naysayers. They have not been able to sleep since the girls came back. “You are not unaware of the reactions of the naysayers – the main opposition Peoples Democratic Party in particular – to the release of the Dapchi girls. What called for non-partisan celebrations was rather thoughtlessly turned into politics, bad, despicable politics that has no place in any democracy. At times of national tragedies, countries unite. This is the norm everywhere. He said the PDP and others did not understand that terrorism was a global problem and that a terror attack on any country was an attack on all countries. According to the minister, the United Nations is among the first international organisations to condemn the abduction of the Dapchi girls and also among the first to welcome their release. Mohammed added, “Perhaps, we should ask the PDP what it knows about the abduction of the Dapchi girls, going by its statement that their abduction and release were stage-managed. The party made itself a laughing stock within and outside Nigeria with that statement. The minister also said President Muhammadu Buhari’s response to the Dapchi incident marked a departure from the attitude of the Goodluck Jonathan administration in the aftermath of the kidnap of 276 schoolgirls in 2014 in Chibok, Borno State. He said whereas it took the last administration 18 days to even acknowledge the kidnap of the girls, the current administration was responsive and not in denial. He said the President promptly sent a delegation twice to Dapchi and Damaturu, ordered the service chiefs and the Inspector-General of Police to take charge and brief him daily on efforts to return the girls among other cogent security measures. “It was not a surprise, therefore, that this abduction ended about a month after it occurred, and that most of the girls are free,” he noted.